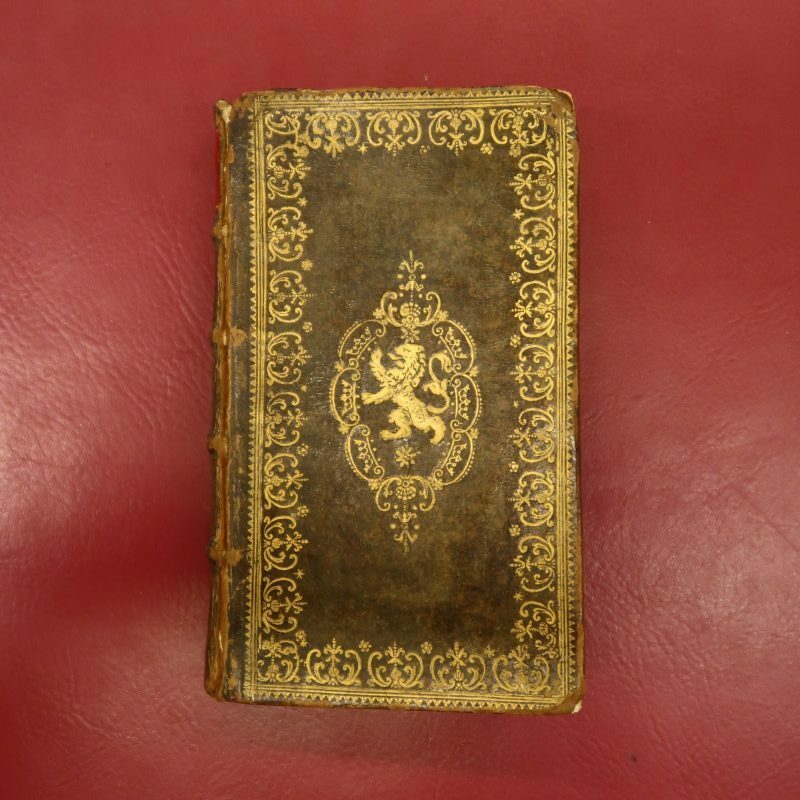 A remarkable copy of the 17th century biography ‘t Leven en bedryf van d’heer Paulus Wirtz is present at Uppsala University Library. It has elaborate gold-tooling to both covers and a letter by the founder of museum Meermanno-Westreenianum pasted in. The work itself seems rather plain. So why is the binding of this average biography decorated with such detail? And how did it end up in Uppsala? Paulus Wirtz (or: Paul Würtz) (1612-1676) was an officer and diplomat who spent his career in German, Swedish, Danish, and Dutch service. He was born in Husum in Schleswig-Holstein, but it is not easy to pin him down to a specific nationality. The complexity of changing borders, agency and nationality is obvious when we take a look at the different Wikipedia entries for Wirtz. The Germans call him ‘ein deutscher Offizier und Diplomat’, according to the Swedish he was a ‘svensk friherre och krigare’, the French describe him as ‘un feld-maréchal danois’, while the Danes take no national credit and humbly name him a ‘tysk-svensk kriger’. Title-page of ‘t Leven en bedryf van d’Heer Paulus Wirtz. ‘sGravenhage, Pieter Haagen, 1681. Paulus Wirtz served many different rulers in 17th century war-torn Europe and played a prominent role on the European stage. He had military successes in the Thirty-Years War and the Nordic Wars and was vice governor of Swedish Pomerania for some years. He entered Dutch service in 1668 and improved his reputation as a courageous commander when he withheld the French troops from capturing Gorinchem in 1672. He was released from Dutch service at his own request in 1674 and died in Hamburg two years later. The end of his life marked the beginning of claims that were laid on his legacy in all possible ways. Rather curiously, his body was transferred to Amsterdam and buried in the Oude Kerk three years after his death. Contemporary sources claim that the testament of Wirtz was falsified and that the Dutch Republic had taken his legacy – and apparently also his body – under threat of violence. Wirtz was not married, but had an illegitimate daughter. He supposedly left the immense sum of nearly 500,000 guilders, which was claimed by several heirs. 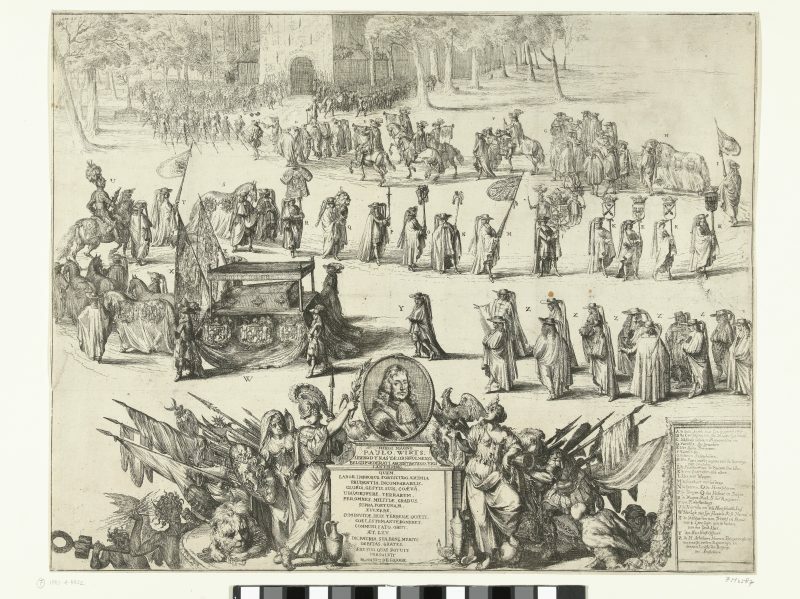 The burial in Amsterdam was a major event in the Dutch Republic and Romeyn de Hooghe captured the moment in an engraving. In 1681 an anonymous biography of Paulus Wirtz appeared in The Hague. The copy that is now at Uppsala University Library (Rar. 10:420) is bound in brown gold-tooled leather, with a gilded lion on both covers. On the basis of tooling and decorations, the binding can be ascribed to the workshop of the Eerste Stadhouderlijke Binderij, or ‘First Stadholders’ Bindery’. This was one of the prominent binderies in The Hague that reached its prime in the second quarter of the century. The provisional name is derived from the fact that the unknown binder had a tool with the coat of arms of stadtholder William IV in his possession. The Uppsala copy comes from the library of Dutch historian Hendrik van Wijn (1740-1831). Though he certainly was not the first owner of the copy, Van Wijn may have been the one responsible for the binding, probably somewhere in the second half of the 18th century. 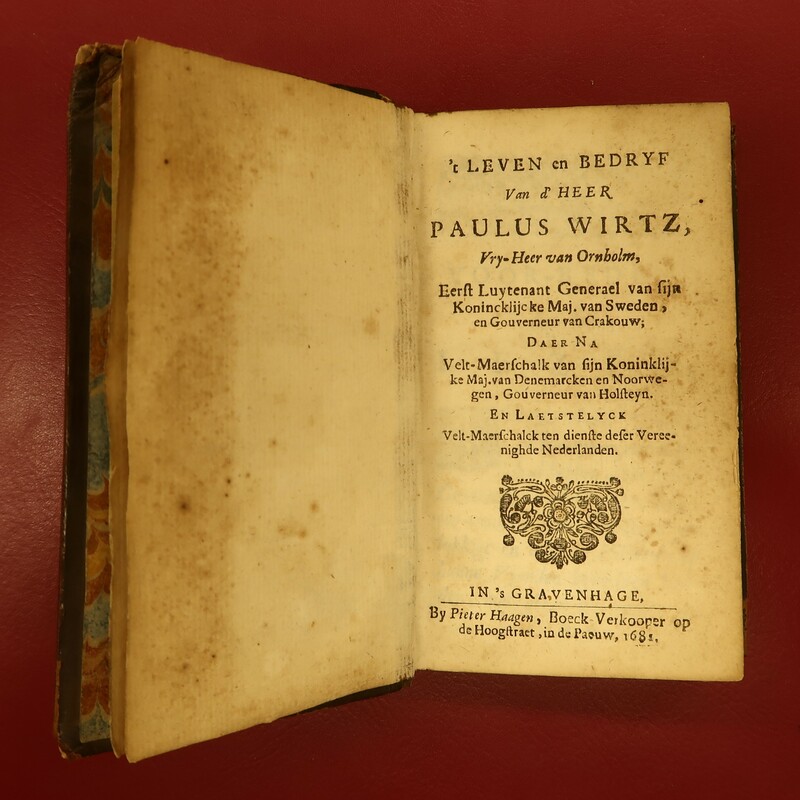 Regardless of the owner who commissioned the binding, it shows that this fairly simple biography was considered valuable, or, that the legacy of Paulus Wirtz was still appreciated two or three generations after his death. A letter by Baron Van Westreenen van Tiellandt that is pasted in the book shows that the book continued to be of interest in the 19th century. 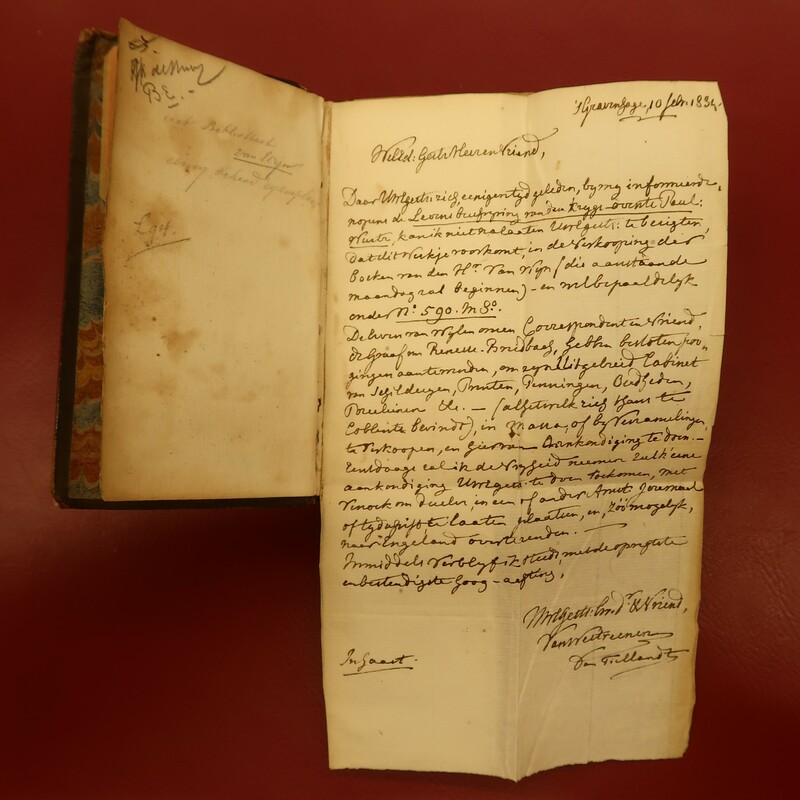 The letter in Dutch is addressed to ‘a friend’ and points out that the biography of Wirtz that they had been talking about is included in the upcoming auction of the library of Hendrik van Wijn. Indeed, the catalogue of the auction lists the biography as number 590 in the octavo section (even though the actual size is duodecimo). It has the addition fr. b., could that be interpreted as ‘fraaie band’, or beautiful binding? In an annotated copy of the auction catalogue that is now at the Koninklijke Bibliotheek, we can see that a person named De Jong acquired the copy for the price of ƒ 1,60. Letter by Baron Van Westreenen van Tiellandt , pasted in the book. So we know that Van Westreenen van Tiellandt informed a friend about the auction and that a certain De Jong bought the copy. It is not clear, however, if De Jong was the friend, or that he was a commissionair who acquired the book for the friend. Another thing we do not know, is when the copy entered the collections of Uppsala University Library. The reason that Baron Van Westreenen van Tiellandt and his friend had discussed the book, was probably because the debate around the legacy of Wirtz was revived in 1829, when a request was filed at the States General. The case of Paulus Wirtz continued to draw headlines until well into the 20th century. In 1910, a group of self-proclaimed descendants formed an association in Cologne to claim the millions that were taken by the Dutch Republic in the 17th century. So far without succes, but it is only a matter of time before a new heir to the millions of Wirtz presents himself. The millions have obviously long disappeared. The most prominent piece of material evidence to the history is the nicely bound copy that is now at Uppsala University Library. Once again, Sweden wins.